It’s that time of year! 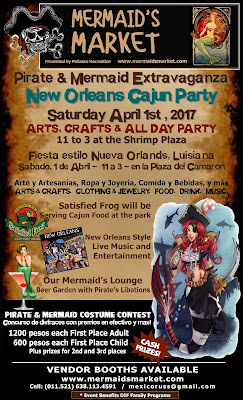 April 1st is the date for this year’s Pirate and Mermaid Extravaganza, bringing the tastes of a New Orleans Cajun party to Peñasco - with pirates and mermaids galore! The Mermaid’s Market is in its 5th year and has become known as a local marketplace to find unique and eclectic ‘mermaid treasures’. . . gifts, clothing, candy, home decor, paintings, photographs and more. This year the ‘Mermaids’ have introduced the Mermaid’s Lounge which is our answer to a beer garden, making Saturdays at the park an even more eclectic, one-of-kind shopping experience. 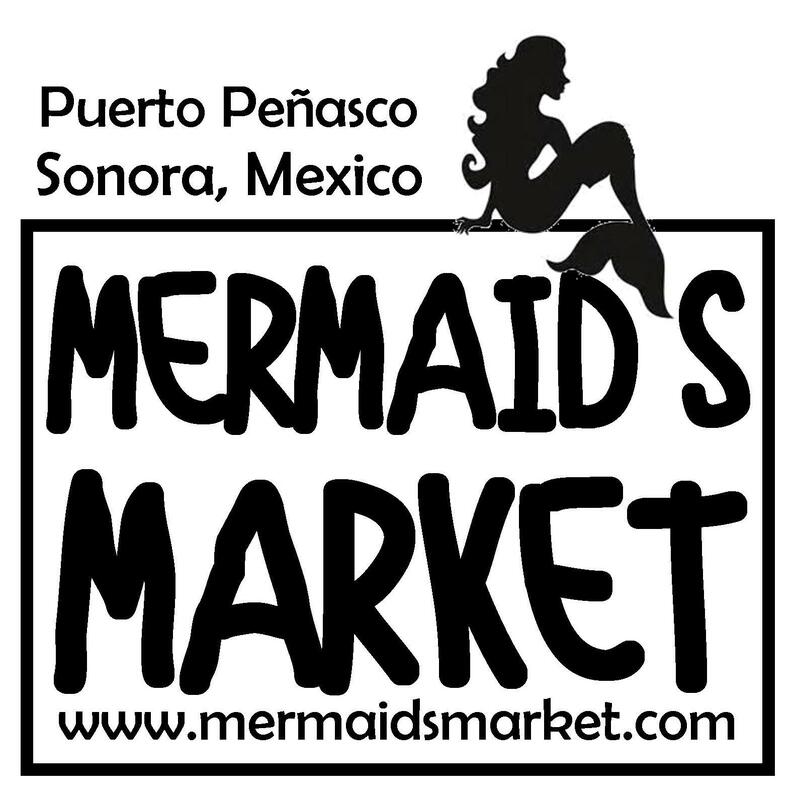 Each 1st and 3rd Saturday (during the months of October through April) you can find ‘mermaids’ selling their wares at the Shrimp Park in the center of Rocky Point. 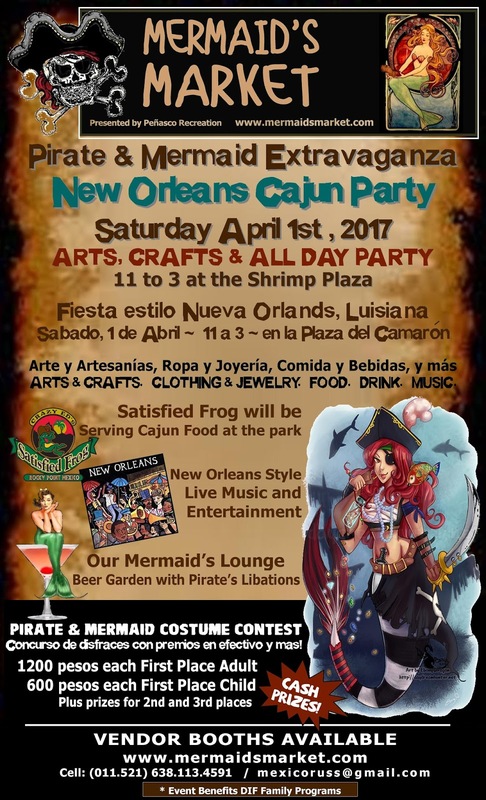 As part of its spring events, the Mermaid’s Market will present the 4th Annual Pirate and Mermaid Extravaganza on Saturday, April 1st. First on the schedule will be a Pirate and Mermaid dance presentation by the Elegante School of Dance. Of course, there will be zydeco music playing throughout the day. 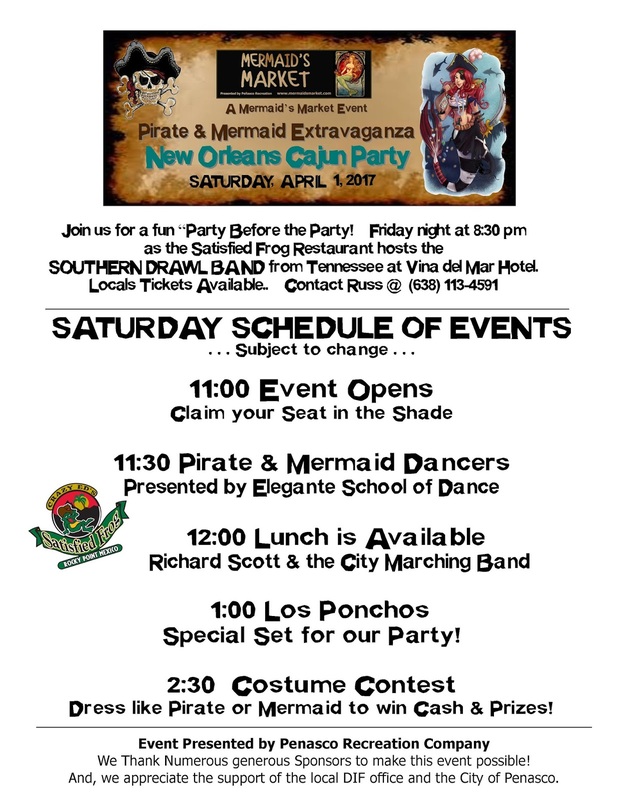 And, at noon Richard Scott and the Puerto Peñasco Marching Band will bring in the sounds of New Orleans! In the afternoon, Los Ponchos - a fantastic local band – will introduce a music set customized just for the Party! Of course, on Saturday you will want to dress in costume as we have cash and other prizes for the best Pirate and Mermaid costumes in both adult and children categories! This year, first place for the adult winners will be 1200 pesos each and for the children’s contest, 600 pesos each. Another highlight will be delicious Tastes of Louisiana from the Satisfied Frog Restaurant served all day at the park! 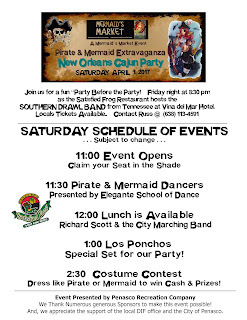 These Pirate and Mermaid cooks will be dishing up their gumbo along with a Rocky Point Shrimp Boil with corn, new potatoes and shrimp, all boiled up with garlic. And, we have a new addition to the menu with one of our artisan cooks bringing us delicious crab bisque! There will be 20 vendors with their Mermaid's "treasures" along with our themed drinks at the Mermaid's Lounge: Blue Mermaid Margaritas and New Orleans Hurricanes. It promises to be a great day. Don't miss it! I went to this place with local friends and we had a blast here. The long happy hour definitely ensures a full upstairs, but I'd recommend the quieter downstairs at Chicago venues to enjoy your stuffed burger and fries!